April 25: Course Open. Carts and driving range on grass, short game area open. In the autumn of 1998, a local businessman/accountant who was passionate about the game of golf decided to develop what was missing in the western part of central New Jersey. He envisioned a true championship golf-only private club. A club with no homes, pool or tennis. Just a golf course located on a spectacular piece of property with world-class practice facilities. His vision also included the course being designed by his favorite designer, world renowned Tom Fazio. This is how the widely acclaimed Ridge at Back Brook Golf Club came into existence. Since its opening in 2002, The Ridge, located in Ringoes, New Jersey, has received and continues to receive local, regional and national accolades. Members, guests and individuals associated with the golf industry regularly use the words “great, fantastic, favorite course, impeccable conditions” when describing their experience at The Ridge. 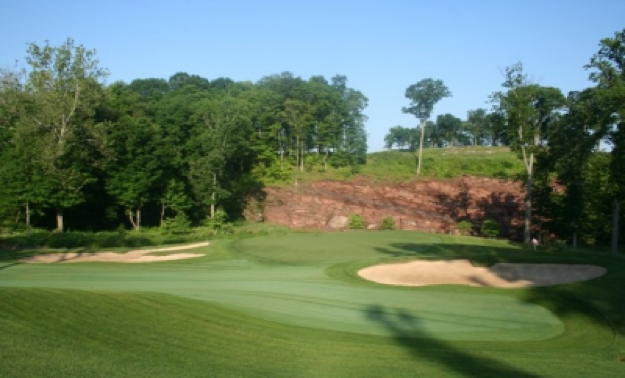 Any discussion of the best private courses in New Jersey and the metropolitan area has to include The Ridge. In fact, the club was GolfStyles’ Editor’s Choice for the best private course in New Jersey for 2016. Would it be realistic to consider the Tom Fazio masterpiece one of the nation’s best private venues? For owner Joel Moore these ongoing awards and acknowledgements are very satisfying as they confirm his original belief that the area was void of a “great” private golf-only club. However, Moore has felt an ongoing responsibility that in order to maintain those so- called great standards and quality that the course initially had, periodic changes would need to be made. From a bird’s eye view above the 300-acre layout, your eye immediately falls on the unique outcroppings of red shale that appear lifted from a New Jersey mountainside. In fact, they are an indigenous part of the terrain Fazio built into the design. A spine of rock splits the seventh fairway into two distinct lower fairways approaching the par-5 green. A 100-foot wall of red shale frames a backdrop for the par-3 eighth hole. Exposed red rock exists behind the fifth, ninth and 18th greens. Even without the exposed rock, every shot on every hole presents the golfer with Fazio’s signature “wow factor” – the feeling that you just want to stand and admire the view for awhile. However, again from an overhead view, it’s nearly impossible to see what aspect of The Ridge at Back Brook could be improved. Yet, the course has undergone constant improvements, almost from the day that it opened. For example, members and early guests will notice that the entrance to the course has been beautified with new stone walls and automatic gates. Before someone plays the course, or after a round, members can sharpen their chipping and pitching skills on a new short- game area. There’s also a recently completed, 30,000-square-foot putting course where members can work on skills they need to master The Ridge’s deceptive and treacherous greens, or gather for a friendly 18-hole putting contest. For Moore, these makeovers and improvements to an already excellent golf course are a natural part of the business. Moore divides the changes into two major categories. Some are simply a natural progression of maintaining the high standards and course conditions of an already exceptional course. For example, some trees have grown too large, infringing on the playing surfaces, and need to be trimmed or removed. Over time, walking paths have been adjusted to match the routes players prefer to take. Fescue has been removed or scaled back outside the playing areas and inside the cart paths. Bluegrass rough has been converted to bentgrass fairways in some areas to improve playability and pace of play. The Ridge’s red rock isn’t just for show on the par five 7th hole – it comes into play if you’re not careful. Integral components of a golf course, such as bunkers, require more attention than most golfers realize. In addition to losing sand when a player blasts his/her shot out of the bunker, the bunker faces require constant maintenance. All the bunkers at The Ridge have been renovated with improved sand, drainage and matting. Errant balls that venture into the treeline are never a bargain, and shouldn’t be. Still, golfers should have a chance to put the ball back in play. Moore has had his grounds crew thin out the wooded areas, cutting back branches and trees, so players have a chance to escape. The evolutionary process always begins with Moore. Then the projects spread out among various vendors and experts. As a part of that evolution, The Ridge since 2002 has added 14 new tee boxes to provide a wider set of options for playing each hole. There are new back tees on the first, ninth and 14th holes and a new lower back tee on No. 8. 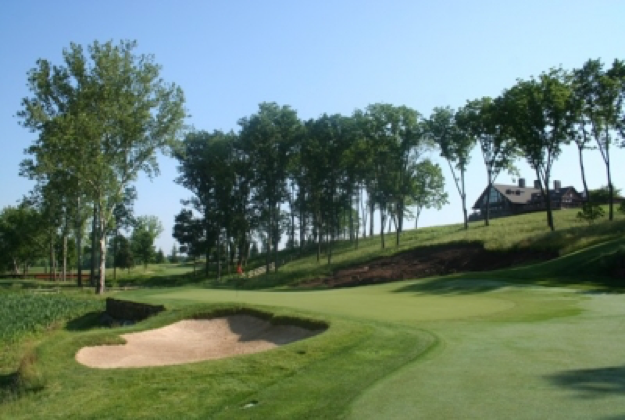 The club added additional member tees to the second, seventh, ninth, 16th and 17th holes. Three new tees now open up options on the par-3 12th and larger tee boxes were added on holes eight, 13 and 17. On the second hole, a newly enlarged green now extends to the edge of the water giving it the look of an island green, which allows for some challenging pin placements. The line of trees behind the sixth green is now gone, providing a look from the fairway that the green has an endless backdrop. You can see some of the most ambitious changes on the ninth hole. In addition to three new tees, the hole now features two new ponds, a larger green and a new boulder wall that supports the green above one of the two new ponds. The 12th hole also has an enlarged green and a new boulder wall that hugs one of the five ponds and lakes at The Ridge. The green on No. 13 has been expanded on the left side to create a new approach. Even what some consider to be the course’s signature holes, seven and eight, have seen improvements. 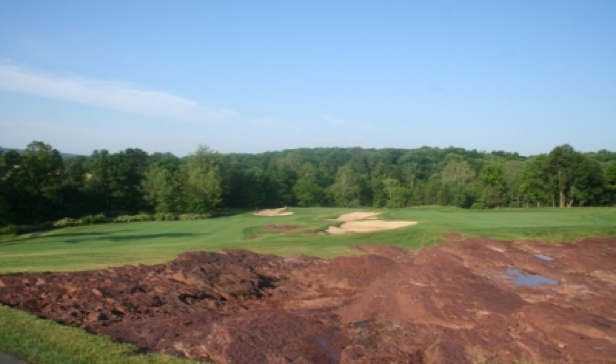 The upper fairway was lowered in order to get a better view of the exposed rock, and there’s more of the course’s unique red shale to see from the lower left fairway. The par four 9th hole concludes within site of the clubhouse, and incorporates all the elements of The Ridge – red rock, the stream and wetlands. There’s also more red shale visible on the 100- foot vertical wall behind the eighth green. The changes and improvements sit well with the members, according to Moore. “The Ridge members appreciate and understand that our number one goal is for The Ridge to be as good as it can possibly be and, based on that philosophy, they look forward to the changes that we are regularly making to the course and related facilities,” Moore said.